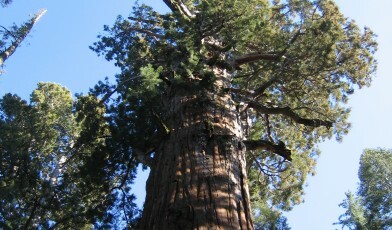 Sequoia sempervirens, otherwise known as the Coast Redwood is the world’s tallest tree species. The tallest living individual of this species is named Hyperion and measures over 115m tall and nearly 8m in diameter. This species grows in a long, thin coastal area along the Pacific Ocean of North America, where it rains all year. Its forests have diverse and abundant undergrowth and there is also high biodiversity tens of metres up in the tree within the complex branch systems of the redwoods. The Coast Redwood has a conical crown, with slightly drooping branches, the needles are different to those of the related Giant Redwood, they are bigger and flatter. The bark is reddish brown, very thick (up to 30cm) and soft to the touch. This thick bark, together with high foliage, provides this tree with protection from both fire and insect damage, contributing to this species’ longevity. The oldest recorded specimen is about 2,200 years old. This species used to occur naturally along much of coastal California and Oregon but an estimated 96% or more of the redwood forest has been cut down. This species is fast growing, has very straight trunks and an excellent quality of wood, which led to its high demand as a timber species. Felling of this species is now illegal. Most of the few remaining stands are now subject to in situ protection in National and State Parks. The Coastal Redwood is popular in botanic garden and arboreta collections around the world. The Global Survey of Ex situ Conifer Collections reports this species as being held in 169 collections worldwide.